Salt Lake City, UT – It sounds truly European in its scope: over 18,000 skiable acres, 100 lifts and more than 750 runs, all on one lift ticket. And if the operators of seven of Utah’s 14 ski resorts have their way, it will become reality sooner rather than later. 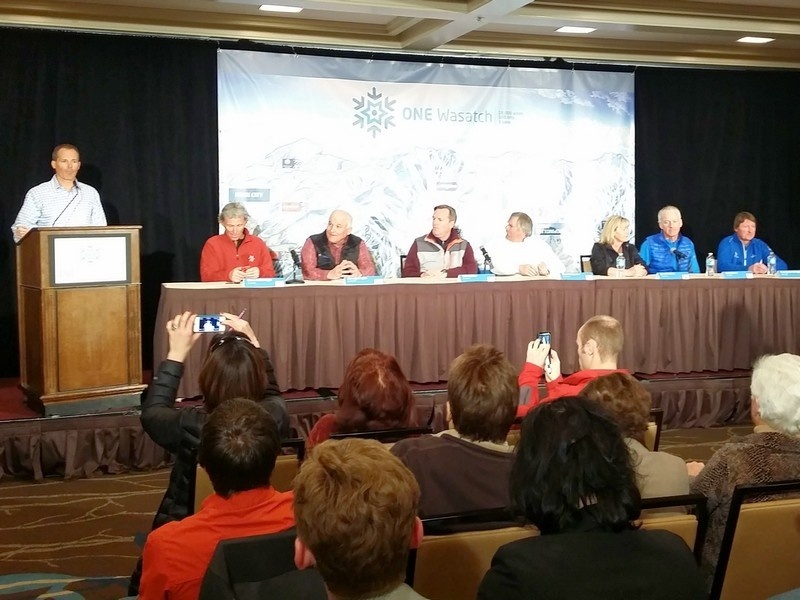 The general managers of Alta, Snowbird, Brighton, Solitude, Park City Mountain, Canyons and Deer Valley all gathered in Salt Lake City on Wednesday to unveil the concept of ONE Wasatch at a press conference hosted by Ski Utah, the marketing arm of the Utah Ski and Snowboard Association. The meeting brought to light the formation of the new Mountain Accord, a formal association of the seven resorts dedicated to one day bringing to fruition a ski resort interconnection long dreamed of by many skiers and snowboarders, visitors and locals alike. 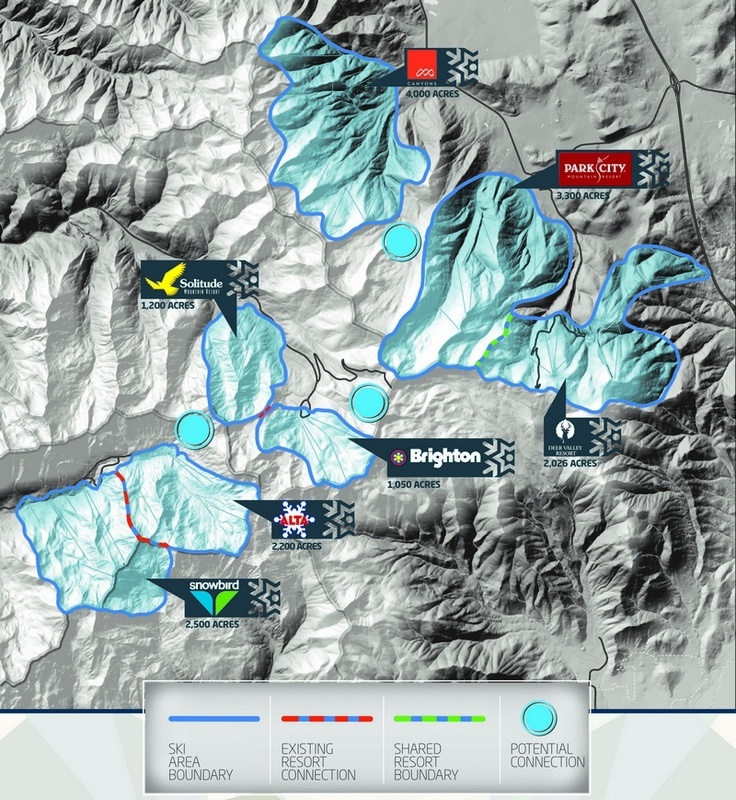 A ski interconnect would also ease transportation issues between the Cottonwood Canyons above Salt Lake City and Park City, Utah’s only true ski resort town. Getting from Park City to Snowbird, for example, would take approximately 90 minutes via ski runs and lifts stretching across nine linear miles, as opposed to the more than 40-mile drive that it takes today, and vehicular traffic would be lessened on treacherous and avalanche-prone canyon roads. Wednesday’s press conference, however, was long on ideas but short on details. “We don’t have a timeline,” acknowledged Rafferty, joking that “it won’t happen this weekend.” He added that following Wednesday’s unveiling, “All the resorts will now enter an education and advocacy role.” It would then be up to one of the involved resorts to take the next step and propose one of the ski lifts necessary to bring the ONE Wasatch concept to life. Unlike the now-tabled SkiLink proposal between Canyons and Solitude, ONE Wasatch can be accomplished entirely via lifts and runs built on privately owned land, although officials declined to identify details of any proposed lift alignments. All seven resorts in Utah’s central Wasatch Mountains lie in remarkably close proximity to one another. It’s impossible, however, to drive directly between them during the winter months. Although discussed informally for decades, the idea of interconnecting the resorts was first formally broached in meetings with then-Utah governor Norman Bangerter in 1985. Snowbird and Alta have been connected to one another in Little Cottonwood Canyon since 2002, and although connected informally for many years by the SolBright trail, Big Cottonwood Canyon neighbors Brighton and Solitude took that step formally for the first time this winter by offering a joint lift pass. After Canyons and Solitude first proposed SkiLink in 2011, a bill was brought before Congress to facilitate a federal land swap to allow that lift’s construction before being subsequently withdrawn. The proposal for SkiLink was completely dropped after Vail Resorts acquired the lease to operate Canyons Resort in 2013. In addition, Deer Valley and Park City Mountain Resort are separated only by a rope line, and when the resorts’ respective Empire Express and McConkey’s Express lifts were constructed in 1998 they were placed in such a manner to facilitate an eventual resort connection. ONE Wasatch would therefore require new lifts and runs in only three corridors: between Big Cottonwood and Little Cottonwood Canyons, between Park City Mountain Resort and Big Cottonwood Canyon, and between Park City Mountain Resort and Canyons Resort. In total it is expected that ONE Wasatch would cost no more than $30 million to implement, with no public funds required. RFID-enabled lift access would facilitate lift revenue sharing amongst the resorts, much as it is already done in Europe’s mega ski regions like the Dolomites and the Trois Vallées where sometimes even a sheep herder owns just a single lift, as Deer Valley’s Bob Wheaton pointed out. Slackcountry skiers can already ski into Big Cottonwood Canyon from Canyons Resort or Park City Mountain, and back and forth between Big and Little Cottonwood Canyons: one can even today traverse from Solitude’s Summit lift to Alta’s Grizzly Gulch, while skiers heading in the other direction can drop into Brighton from Alta’s Supreme lift. Wieringa suggested that Alta’s long-proposed lift in Grizzly Gulch could more easily create a connection between the two canyons. Likewise, the Flagstaff lift proposed by the resort for avalanche mitigation efforts could also drop skiers into Big Cottonwood Canyon. Environmental and backcountry ski advocacy groups are expected to oppose the ONE Wasatch concept vociferously. Carl Fisher, the executive director of the environmental group Save Our Canyons who watched Wednesday’s press conference from the back of the room, was unwilling to accept any compromise that involves the four ski resorts in the Cottonwood Canyons. “We compromised 30 years ago when the resorts were established,” Fisher said. “You could very easily connect some of the Park City resorts and have the biggest connected resort complex in North America. If they’re looking for marketing, there’s the angle, but we are vehemently opposed to any connection of the Cottonwoods. Proponents of ONE Wasatch disagree. They point out that ski resorts lease 6,743 acres of public lands, or about 0.27 percent of the nearly 2.5 million acres encompassing the Uinta-Wasatch-Cache National Forest. By contrast, a full 26 percent, or over 646,000 acres, are designated wilderness areas that are off-limits to any development whatsoever. They also emphasize that the ONE Wasatch concept does not require that any new lifts or runs be constructed on public lands. Representatives of the seven resorts and Ski Utah all maintain that the environment, Salt Lake County watershed and backcountry skiers will remain of paramount importance throughout the planning process.